You are currently browsing the tag archive for the ‘Custom circle cupcakes’ tag. "It's A Girl" Baby Shower Cupcakes! These Cupakes were made for a Baby Shower celebrating a baby Girl who’s name will be “Gianna” which is why there are so many “G’s” all over the tops of the Cupcakes. The baby bottles were edible, and made out of our made from scratch Marshmallow Fondant and the cutest things ever, and the pink and purple were at the request of the parents to be 🙂 The Red Velvet Cupcakes which are a popular favorite at the Bakery were once again a huge hit, we were told by the happy couple. 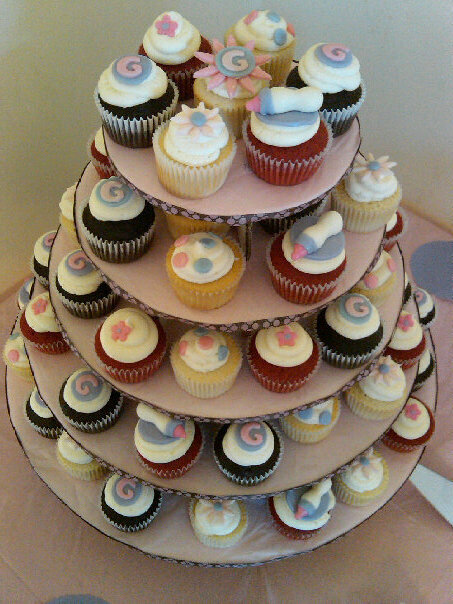 This was not just a Cupcake Baby Shower, it was a Tiered Cupcake Baby Shower complete with a tiered stand decorated to match the color scheme on the invitaitons! These Cupcakes were a fun memorable way to celebrate the Baby Shower and were a huge hit among the guests! 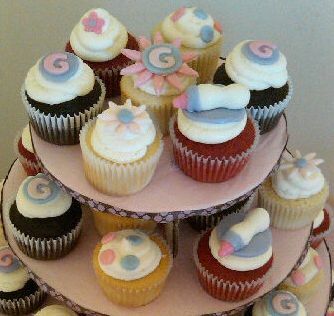 Baby Shower Cupcakes with letter "G's", Baby Bottles, Dots, and Daisies! Interested in ordering Cupcakes for your next event? Have a Baby SHower coming up or know someone that does? 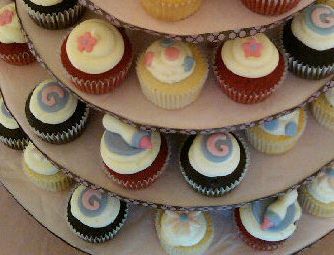 Mention Bear Heart Baking Company to your family and friends for there next Custom Cupcake Tier! Custom Baby Shower Cupcakes York PA Bakery!